to do something new and exciting. Designers Interpretations: A suspended leather chamois in this design repeats the beige background of the bold wall sculpture. Cork bark interprets the rough acrylic clay, highlighted by dried beige Ruscus leaves. Lotus pods painted sky blue depict the blue bubbles seen, while a matching color frame continues the modernistic approach of both designs. Designers Interpretations: The structures of technology merge with nature producing unforeseeable results, creating a type of shell game that we all play. Designers Interpretations: Dyed water creates layers of color, amid right angles constructed from bamboo and the contrasting shapes and textures of flowers and other plant materials and glass beads. Designers Interpretations: Lights and glass tiles create the color and excitement of a carousel, with swirling grasses giving motion to this design. Designers Interpretations: This design depicts the underlying strength needed to make something as delicate as a flower achieve its ultimate goal. Designers Interpretations: Natural grape vine establishes the perch on a larger grape vine base representing the forest floor. 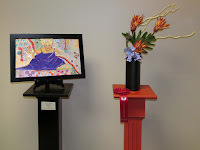 Celosia on pine cones with lily and feather accents represent the artist’s subject with emphasis on the shape, color, texture and the flow of the design. 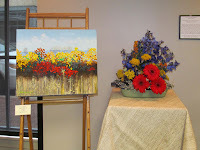 Designers Interpretations: Wildflowers on a foggy day near Wiederkehr Winery near Altus, Arkansas inspired the painter and the floral designer to recreate the autumn scene you see here. 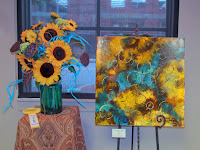 Designers Interpretations: Sunflowers that turn to face life, intertwined with wire circles, show our connection to others throughout life's journey. Blue elements suggest winds of change, and dried lotus pods indicate the slowing of one's vitality. A tree segment base represents both the roots of the beginning and the completion of the circle of life. 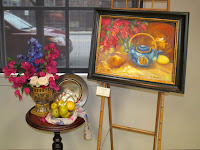 Designers Interpretations: This romantic, stylized, tabletop still-life is interpreted by bright fuchsia bougainvillea blooms spilling over a gold and blue vase, echoing the blue of the teapot and the yellow lemons in the painting. Feminine floral fabric mimics the crescent-shaped teapot handle, while a metal plate recalls the brass disc in the background. Designers Interpretations: Driftwood creates the commanding presence of the Longhorn cow, underscored by mottled cow hide and a ‘pasture’ of dried plants which echo the color and texture of the long face gazing at you! Designers Interpretations: The intensity of the light on the statue against the dark night draws the eye, as does the vibrancy of the colors in the walkway and fountain surround. Birch bark represents the statue, which stands as a lonely, sad sentinel guarding the Square as night closes in. This abstract interpretation recalls the colors and textures of the Bentonville Square. 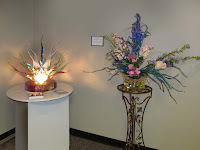 Local artists and floral designers from four area garden clubs came together to create a bouquet of fun and beauty! 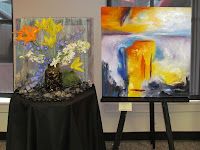 "Duets In Bloom", an art exhibit with floral design interpretations was held at the Arvest Bank Conference Center off the Bentonville Square. 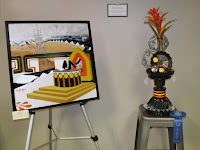 Each club provided 4 designs interpreting art provided by local artists. 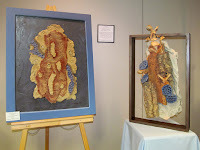 The Duets in Bloom was open to the public at no charge and a wine and hors d'oeuvres event was part of the festivities. 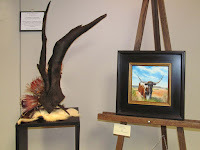 The exhibit was open to the public at no charge on Friday, June 19th from 10:30 am to 4:00 pm and reopened from 5:00 pm to 7:00 pm with wine and appetizers. Saturday hours were from 8:30 am to 3:30 pm. 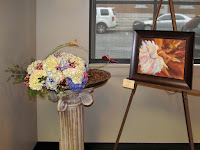 “Duets in Bloom’ was a fun success thanks to so many garden club members who worked hard to make it so! • Mary O’Brien, Barb Templin, Charlotte Brunje, Marsha Jertson, Karen Welch, Becca Mutz, Marion Heath, Jo Staats, and Beth Kastl of the Bella Vista Garden Club. • Char Brunje, Mary Doyle, Deloris Jennings, Geri Hoerner, Barb Templin, Linda Neymeyer of Floralia Arrangers Guild Garden Club. • Janet Bleakman, Deborah Reynolds, Juanita Fryer, Becky McCoy, Leah Whitehead, and Corrin Troutman of the Bentonville Garden Club. Also a most special thank you our very beloved friend, Joan Clifford, who passed away on June 20th, 2015. 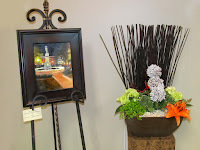 She was a member of the Bentonville and Floralia Garden Clubs and an NGC Flower Show Judge. We will greatly miss her warmth, her friendship and her talents. A very special thank you to Tami Bever, Bentonville Garden Club, for providing many areas of lovely signage, as well as arranging for the cocktail tables and decor for the wine serving table. Thanks also to the members of that club that served wine: Melody Martens, Judy Geigle, Celia Boon and June Carter. 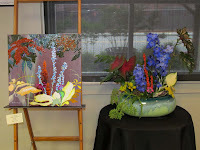 Many thanks to Becky Christenson, Garden Clubs of Rogers and Floralia, for her tireless work in locating the exhibit room, as well as arranging for the artists whose art works were featured in the show. Thanks to the talented artists whose works provided the inspiration for the Floral Designs: Becky Christenson, Millie Bradford Aaron, Leslie Newman, Julie Hayes, Steve Horan, Ed Pennebaker, and Ben Edwards. Thanks also to Debbie Main, of the Garden Club of Rogers, for her help printing flyers and invitations, as well as other signage for the exhibit. Thanks to Tracy Fortuny and Sue Mank of that club for centerpieces, as well as Geri Hoerner of the Bella Vista Garden Club. The Bella Vista Garden Club provided beautiful and healthy appetizers, carefully planned and created by Debbie Edmunds, Beth Kastl, Karen Welch, Barb Templin, Jan Grim, Becky Fox, Judi Shannon, Julia Blair, and Betty Honn. The Bella Vista Garden Club also provided friendly appetizer servers Cathy Downard, JB Portillo, Becky Fox, Vera Martin, Betty Honn, and Meredith Janes, and Tony and Joyce Licausi cheerfully handed out wine tickets. Our hostesses came from each of our four garden clubs and did a great job greeting visitors and explaining the exhibit: Janet Bleakman, Debbie Reynolds, Burnie Ott, Mary Doyle, Barb Templin, Becca Mutz, Sue Mank, Phyllis Stair, Ronna Precure, Ronna Smith, Tami Bever and her mom, Mary O’Brian, Marion Heath, Jerilyn Frentriss, and Dorothy Sandoval. Our sincere thanks to current president,Terry Dushan and past president, Elizabeth Christie, of the ‘Artists of Northwest Arkansas’, who came from Fayetteville to judge the exhibit. 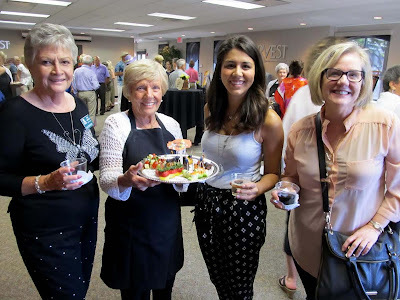 Thanks also to Arvest Bank for the use of their Conference Center and their assistance in presenting this event, and to ‘Guess Who’ for their generous donation of wine through the Bentonville Garden Club. Thanks to Alex Grazinai at Riordan Hall in Bella Vista for help in obtaining table covers and aprons and to Kim Nelson, Garden Club of Rogers and Virginia Halman, Bella Vista Garden Club, for pressing them. Thanks also to Burnie Ott for the fruited water and serving dispensers, and to Mary Doyle, Debbie Main and Becky Christenson for supplying easels. 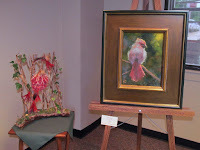 A big thanks to Cathy Wayson for creating a slide show of the exhibit on the Bella Vista Garden Club website: www.bellavistagardenclub.com and for her many hours of care in formatting information about the exhibit, including this letter. Thanks also to Fran Zimmerman for publicity she sent to The Weekly Vista. 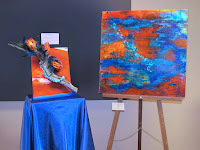 A successful event requires hard work and dedication, as well as creativity - my sincere thanks to you all for contributing those qualities and your talents to ‘Duets in Bloom’ and for the beautiful exhibit that resulted! Four clubs, seven artists, one big success! Designers Interpretations: A landscape scene of a beautiful blue-sky day, with blooming shrubs, when leaves have yet to make their appearance on the trees. The Pointillism style of the artist is represented by small flowerets and the circle patterns of flowers appropriate to this style. The blue delphinium fills the sky while the artemisia represents the leafless trees. The linear color is recalled in orange butterfly weed, yellow yarrow, red rudbeckia and deep green eucalyptus. Designers Interpretations: The rays of light through the clouds, with the waves surging over the rocks, brings hope as dawn breaks. #14: Ascending: The rush of air and energy released by the woman rising above the earth in the art work hits this floral design as she passes by! Designers Interpretations: The rush of air and energy released by the woman rising above the earth in the art work hits this floral design as she passes by! 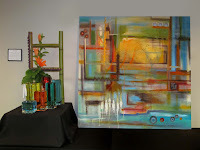 Designers Interpretations: A strong flow of color with a ‘splash’ that makes it come together! 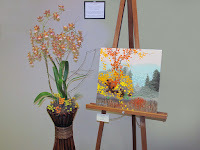 Designers Interpretations: Orchids in fall rust colors and yellow and orange seed pods on a pedestal of leafless stems recall the feeling of autumn in the Ozarks.